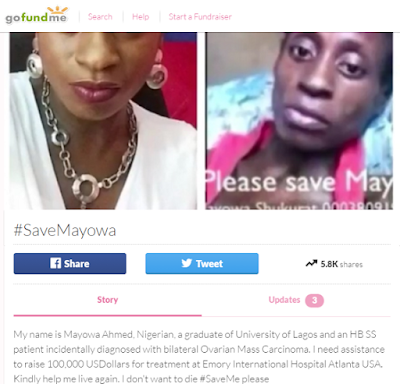 A few days ago, I joined many other Nigerians in donating towards helping a young lady called Mayowa with Ovarian Cancer which was already affecting her liver who needed financial help to enable her go abroad for medical treatment. I was so moved by her plight especially since I had lost a child to liver issues (Bilary Artresia) many years ago so I know how painful and difficult treatment for such usually is and the toll it takes on the family. 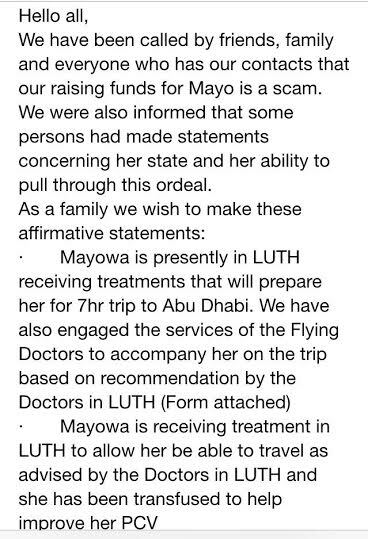 You can then imagine my shock when the news hit today that it was all a scam after millions of Naira had been raised already. Scam? was she sick or not? 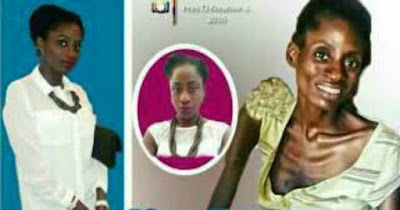 Yes she still is but the reports claim the cancer is already at an advanced stage and doctors had already advised her family she can't make it. 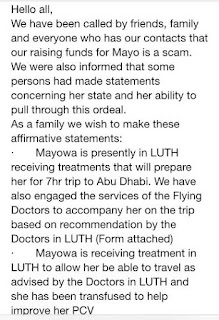 However is it wrong for her family to hope against hope that she can still make it? NO ! After all we have heard of many cases where the doctors report was miraculously overturned despite not being medically impossible. 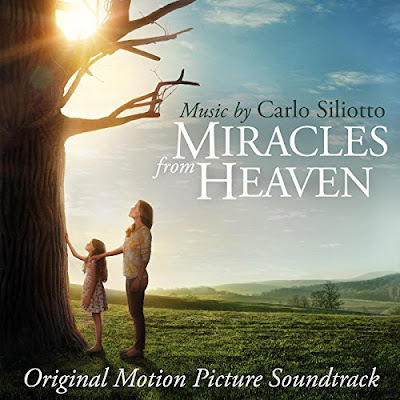 The movie Miracles From Heaven is a perfect example of this as it was based on the true story of a little girl who had a terminal disease and given a death sentence by doctors but by the time God intervened, she got her miracle and when she went back to the hospital, there was no trace of the disease anymore. Meanwhile, there has been so much uproar with some people saying they will not help anyone again among other things. Well, first off, helping people is a prerequisite as a child of God. Even the Bible tells us that Jesus Christ went about doing good even to His enemies and till death while still being nailed to the cross it was about saving even his killers! Helping people is not about getting a reward from the person you helped, its all about adding value to that person's life in any way you can no matter how little and of course its the thought that counts. 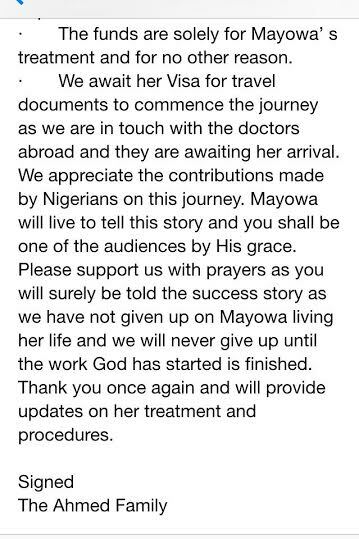 Some people might have given to #SaveMayowa in thousands and some tens of thousands and even some in hundreds, honestly, its the motive behind your giving and I can tell you for a fact that God rewards such genuineness. Amazingly, I gave my widows mite for the #SaveMayowa campaign on Tuesday and as at today, Thursday, I got back a hundred fold of the amount I gave from a source I never even expected! God is the only one that can reward any help or assistance you render to anyone. I don't condone any form of scamming people to make money but my little advice is, don't stop helping people out in any way you can whether in cash or kind because its only God that truly sees the heart and rewards you irrespective of the motive of the person asking for your help. 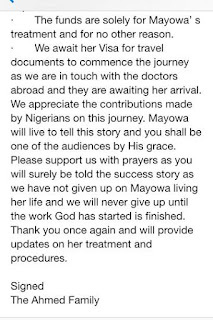 The truth remains that Mayowa is terminally sick, that is not a lie so if you donated it was definitely for a good cause so all you owe her now is prayers for a miracle. With that said, I am thanking God for my life and giving myself a treat by going to have a huge Coldstone Icecream....biko I can't shout. Giving is a commandment from God. What the person, the Church, the Pastor or whoever even the beggers on the street will use what you've given for shouldn't be your concern. God is a rewarder of every gift. It's all about GOD. #Gbam! Bless you for this Seyi! very well said.